Store comic data & images locally, optionally sync with our free CLZ Cloud storage. List, Images or Card View for your comic lists. Different templates for the comic details panel. Just search our online comic database by series title or by barcode. Select the issues that you own. Full comic details like series, issue number, issue title, publisher, imprint etc..
Full creator and character lists. Cover images, back covers, preview art and series backdrop art. synchronize your data to other computers and mobile devices. share your comic list online, for friends and family (example). 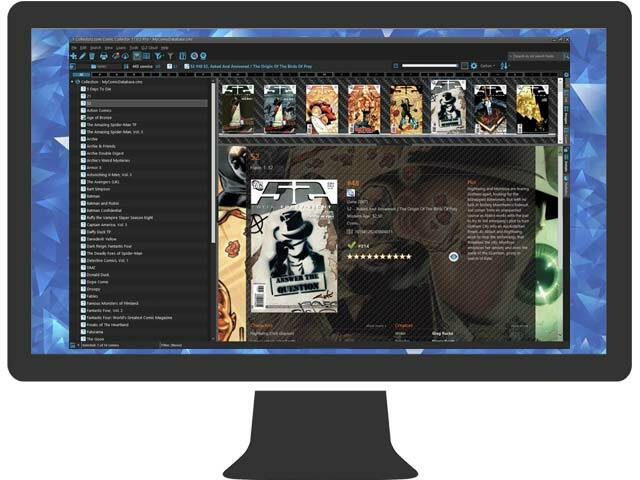 Export your comic database to Text or XML files. Print comic lists in any order, with your configurable columns. You guys are worth it! I want to thank everyone at CLZ for their quick and friendly help whenever I had a question or problem. I specifically want to thank Sytske Hermans and Alwin Hoogerdijk for their help on January 4th and 5th. I Discovered CLZ when i made a descision to start collecting comic books again. I had a small collection left from when i was a kid, it was something i did with my dad who passed away back in the early 2000's. After he died a big part of me was like "What's the point". Like many things at the time, it all kind of faded away. So When i Made the Descision to collect again I Quickly realized i needed away to know what i already had. To This end, I found CLZ, it was affordable, and super easy to use, plus it was accessable on my phone which made it a great tool for when i hit the shops. I have been using the Comics Collector sw for about 10 years to increase my happiness and joy with my collection. I had always wanted to organise my collection so that all the relevant publisher, creator information and the covers would be easily located and sorted. An attemptt to create a spreadsheet that would do this for me gave me the pleasure of a deep dive into my collection and a severe back ache from sitting with my laptop on a broken sofa. I came accross Comics Collector and tried it out and it has been contributing greatly to my happiness ever since. I've been using CLZ for my comics for 3 or 4 years now and had been doing things manually before that. My collection currently exceeds 18,000 books and I've been collecting for decades. When I started collecting, I kept a hand written ledger of my books so I wouldn't spend my hard earned cash on duplicates. When Lotus 123 came on in '83 (does anyone actually remember Lotus 123? ), I procured a copy and transferred my entire collection to a spreadsheet. Awesome. My first actual backup, besides my hand written book, was to a 5.25" disk. After Lotus was crushed by Microsoft, everything had to go to Excel. I believe that most everyone has a horror story regarding hardware and mine was a crashed hard drive in '96 that ate my data and left me with just a 3.5" disk that contained the backup of my comic collection. Needless to say, the disk turned out to have been corrupted at some point and I was back to ground zero. With all of the writing and keyboarding over the years, I'm pretty sure I'm patient #0 for Carpel Tunnel Syndrome. It was then I decided the Comic Books gods did not want me to know what I had in my collection so that Marvel, DC, Charlton, and the rest could get more of my hard earned cash since I'd likely be buying duplicates at one point or another. It uncovered more than 3,000 duplicates (hard earned cash out the window. My ex-wife was angry about that tidbit). The initial time of entering them into CLZ was considerable, but necessary. Now when I buy 2 or 300 books at a show, it's so easy to get them into the system. I finally know exactly what I have and I know it's safe from most any tech disaster that I might have. Most important in all of this? It provides a safe place for my database. Something I didn't have for 40 years. I now do a yearly show or two. Because of all of that, it would be almost impossible for me to remember how many books I have in my collection (6712) vs how many are in my "sale boxes" (1200) without CLZ. Your product goes everywhere I go on my phone--putting an end to the "I wonder if I have that?" stuff that goes on at dollar bins. I am a 56 year old lifelong comic fan...and still collecting. I have about 15,000 comics and before discovering CLZ I used a looseleaf notebook to add all my comics. Needless to say, this turned into a ripped, and disorganized mess very quickly. Of course, I was only able to catalog the title and the issues that I owned and I could never see the critical data or the comic covers. I love this product and probably use it more than any other that I have purchased. I rely on it to keep my comic collection where it is accessible both at home and away. A while back I was looking for a good way to tabulate my comic book collection and, knowing that I was going to be buying comic books again, I needed a good tool to keep track of them all. I demoed a few software options as well as the tried-and-true Excel spreadsheet method but nothing worked so seamlessly as CLZ. The ability to use a bar code scanner, upload data to the cloud, ease of use, cover photos of all the comics, fast and friendly customer service all contribute to why I love the software and will continue to use it. It's so awesome when I go to a comic store, see a comic that I think I need and able to check quickly on my phone on my collection, see that I already have the comic so I put it back saving myself money.